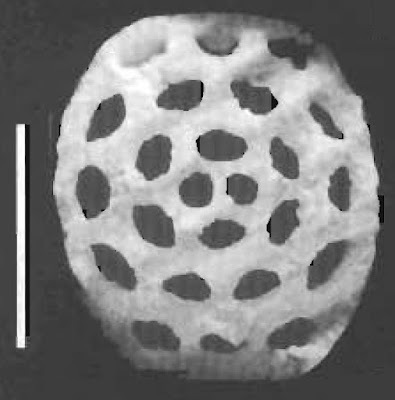 Sclerite of Palaeocaudina regia, from Boczarowski (2001). Scale bar = 200 µm. The Elasipodida are a group of mostly deep-sea holothuroids with a bilaterally symmetrical body pattern in which the dorsal tube feet have become modified into elongate sensory processes (Pawson 1966). Members of this group include some of the atypical species of sea cucumber, such as the 'sea pigs' of the Elpidiidae or the pelagic Pelagothuria natatrix. [FE66] Frizzell, D. L., & H. Exline. 1966. Holothuroidea—fossil record. In: Moore, R. C. (ed.) Treatise on invertebrate Paleontology pt U. Echinodermata 3 vol. 2 pp. U646–U672. The Geological Society of America, Inc., and The University of Kansas Press. [GD00] Giribet, G., D. L. Distel, M. Polz, W. Sterrer & W. C. Wheeler. 2000. Triploblastic relationships with emphasis on the acoelomates and the position of Gnathostomulida, Cycliophora, Plathelminthes, and Chaetognatha: a combined approach of 18S rDNA sequences and morphology. Systematic Biology 49: 539–562. [P66] Pawson, D. L. 1966. Phylogeny and evolution of holothuroids. In: Moore, R. C. (ed.) Treatise on invertebrate Paleontology pt U. Echinodermata 3 vol. 2 pp. U641–U646. The Geological Society of America, Inc., and The University of Kansas Press.